It was one of North America’s longest droughts. The Chicago Blackhawks, an Original Six NHL team, had not won a Stanley Cup Championship since 1960-61. That famous team featured legends Bobby Hull and Stan Mikita, and had entered into Windy City lore. Thirty years passed, then forty. The 1990’s turned into the 2000’s, and still the team was a perennial disappointment. In one lone bright spot, the 1990-91 season saw a Campbell Conference title, with a roster of rising stars like Jeremy Roenick, Steve Larmer, and Chris Chelios. But that was also the era of Mario Lemieux’s Pittsburgh Penguins, and Wayne Gretzky’s Edmonton Oilers/Los Angeles Kings. The path to the Stanley Cup was fraught with danger, and almost two decades would pass from that 1990-91 season before the city of Chicago, let alone the sports world, was paying attention to the Chicago Blackhawks again. A former defenceman who skated for the Vancouver Canucks, Pittsburgh Penguins, and yes, the Chicago Blackhawks, Dale Tallon joined the Blackhawks front office in 1998 as director of player personnel. In 2003, he was promoted to assistant general manager, and finally, in 2005, was named the general manager. His first season in charge saw the Blackhawks bottom out in the West, but that put them in perfect position to draft a future cornerstone. 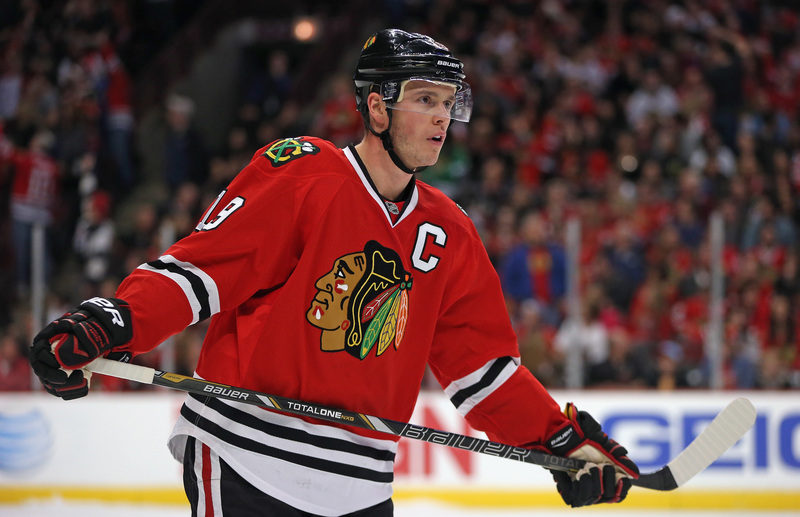 The rock on which Chicago built its church: Jonathan Toews. In the spring of 2006, Chicago held the third overall pick in the NHL draft. The team had a noticeable gap at centre, and had the choice between Sweden’s Nicklas Backstrom, and Winnipeg’s Jonathan Toews. Tallon believed in the young Canadian, and chose him to be the team’s next star, and captain. Adding Toews did little to improve the win total of the rebuilding Blackhawks, and as such, in 2007, Tallon held the first overall pick in the draft. Faced with another difficult choice, Tallon and his staff chose Buffalo’s Patrick Kane over New Jersey’s James van Riemsdyk. In hindsight, those may end up being the absolute best consecutive first-round picks in history. With Toews and Kane joining forces with other signings Patrick Sharp, Kris Versteeg, and Brian Campbell, the Blackhawks began to rocket up the Western Conference standings. Meanwhile, the Blackhawks were also making moves off the ice. Looking for leadership in the front office, owner Rocky Wirtz turned to another historic Chicago franchise. Poaching from the Chicago Cubs, Wirtz hired John McDonough, former Cubs president, to become president of the Chicago Blackhawks, guiding operations for the up-and-coming franchise. In 2008-09, Chicago re-entered the playoffs for the first time since 2002. They marched through the first two rounds before falling to the vastly more experienced Detroit Red Wings in the Western Conference Finals. But the world was starting to take notice. Feeling the need for more scoring, Tallon added forward Marian Hossa, which would prove to be his final noteworthy transaction. With a solid roster and a (mostly) savvy front office, the Blackhawks had almost all of the pieces needed to compete for a Stanley Cup. Tallon, while still GM, hired Joel Quenneville away from the Colorado Avalanche to be their head scout. Soon after, Quenneville was promoted to the head coaching position, and in 2008-09, his first season in charge, he lead the Hawks to the aforementioned Western Conference finals. Less noticeable, however, were problems behind the scenes in Chicago. Tallon was coming into conflict with team president McDonough. Some inside the organization believed McDonough was envious of Tallon, who was receiving heaps of praise for turning around the moribund Blackhawks in a short amount of time. Others argue that Tallon almost royally screwed up Chicago’s offseason, by missing the deadline to tender contracts to restricted free agents. The NHL Players Association filed a grievance with the team, and Tallon took the blame for the screw-up. Since they had missed the deadline, the Hawks had to offer market value to restricted free agents, including key pieces like Kris Versteeg and Cam Barker. In the spring of 2009, Tallon was demoted to the role of senior adviser, while Stan Bowman was named the team’s new General Manager. 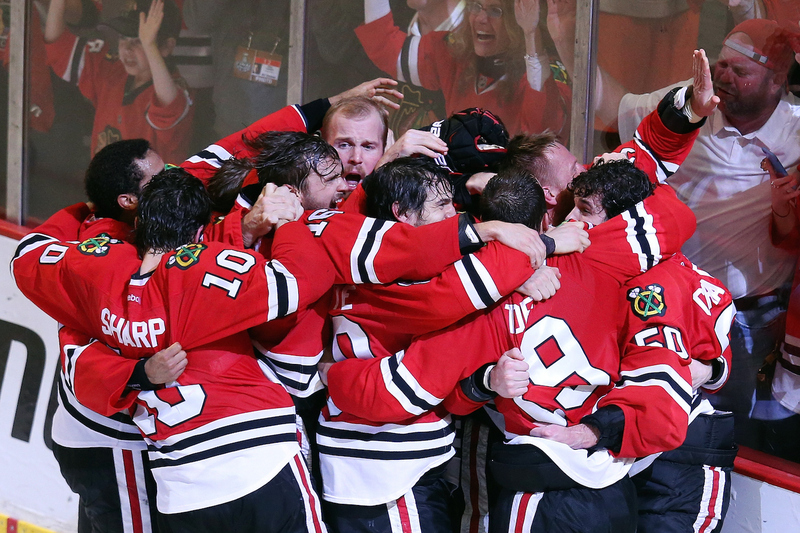 The next season, the Blackhawks won their first Stanley Cup since the days of Mikita and Hull. Although no longer officially the team’s General Manager, Tallon’s name was engraved on the cup with the organization, and he was issued a ring. Tallon would depart the team soon thereafter, and was hired as the general manager of the Florida Panthers, a position he continues to hold. Under Quenneville and Bowman, the Hawks stayed in the playoff race for the next two seasons, but bowed out in the first round each time, first to the Vancouver Canucks, and then to the Phoenix Coyotes. At the start of the lockout-shortened 2012-13 season, Quenneville and Bowman were being criticized for standing pat and not renewing the roster after two disappointing playoff exits. Then, they went on an almost-unprecedented run. That season, the Blackhawks finished with 36 wins, 7 losses and 5 overtime losses, for a total of 77 points in 48 games. That hot run continued into the spring, as the Blackhawks rolled through their opponents and captured their second championship in four seasons. Quenneville and Bowman were safe again, and the expectations of the Chicago fans were healthily inflated. Last season, they advanced to the Western Conference Finals, before falling to the Los Angeles Kings in seven games. Again, the franchise chose to stand pat and believe in their core group, with one key exception. Bowman, looking for forward depth, added veteran Brad Richards. There’s a lot of talent right there on the ice. Much like the NBA’s San Antonio Spurs, and the MLB’s St. Louis Cardinals, the Chicago Blackhawks have quietly built a winning franchise, one that is sustainable in the long term. With a decade’s worth of smart draft picks, a sharp and sturdy head coach, and a wise front office that is hesitant to make big splash signings, the Blackhawks have managed to build North America’s hottest new sports dynasty. And while his name may no longer be engraved on the cup, nor a ring worn on his finger, former General Manager Dale Tallon, watching from his couch in Florida, can rest assured that his fingerprints are all over yet another Stanley Cup-winning Chicago Blackhawks team.